So, if you’ve never come across the term, “Circuit Bending” is a sort of underground craze. Basically, it’s creatively short-circuiting otherwise perfectly good electronic equipment, with the goal of creating new, sometimes strange, often other-worldly sounds with it. A very commonly “bent” device is the classic “Speak and Spell” toy (and its variants, like the “Speak an d Math”, etc.) – when you open one up and bridge certain points on the circuit board, you can speed up, slow down, pitch-shift, and otherwise mangle the voices that it creates, often to quite interesting and spooky effect. So… why the heck would you do this? Well, a lot of “noise-based,” soundscape and other “aliatory” music-makers think of these sort of sound makers as a goldmine for creating unusual sonic surprises in their music. And, if you’re into experimenting and creating something new, it’s really kind of fun! Plus, you can buy loads of “toys” to “break” on a pretty low budget. DISCLAIMER: If you try any of this yourself, please limit yourself to BATTERY-POWERED devices only. Short-circuiting the wrong points on AC-powered electronic devices can KILL you. So, my first project, seen above and below, was a practical one for me, since I’m a more conventional player rather than a soundscape artist. I picked up a lightly used Boss DS-1 Distortion pedal for $30, opened her up, and starting playing with different connections on the circuit board. 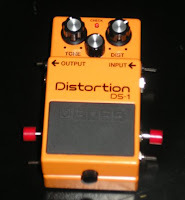 I found several points of interest (thanks to some help on the web of those who’ve bent this pedal themselves) and thereby made a common distortion pedal into something unique and interesting. You can see the switches and buttons I installed into the sides of the pedal; they activate the short-circuits (and, of course, turn them off for normal use). Another way to modify circuits(rather than a simple on/off switch) includes using potentiometers to vary the amount of current flowing to the short, which thereby varies the alteration. Even more interesting, some folks use light-sensing variable resistors; by changing the amount of light entering the light sensor, it changes the sound – cool! Body contacts, to allow your touch to modify the short, is another method commonly used. For my first project, though, I thought it prudent to keep it simple, so I stuck to switches. So there are four different mods, which are turned on and off using the metal switches. I then further modified two of them with the red buttons; by pushing in the button, it puts a tone cap inline in the short-circuit, which modifies the pitch that is added/generated by the short-circuit. Playing with the existing knobs also modifies the bend. All in all, I just wanted to get into circuit bending with a minimum of difficulty and a high level of success (meaning: I didn’t want to “kill” the pedal, and wanted to have something I could actually use when I finished.) I did exactly that; I now have a “new” pedal which can make unique and unusual (but useful) sounds, and I did it myself for under $50. ‹ The Circuit-Bent DS-1 – a Video! My Telecaster – Modded to the Extreme!